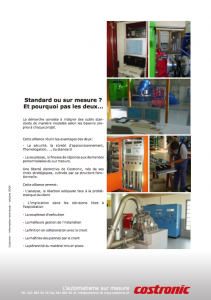 Costronic is expanding on international markets. Indeed, we are determined to apply our skills outside Switzerland and have decided to join an international group of a human-scale, the CMR Group. Our common ambition is to expand our portfolio of solutions and develop them in the hydroelectric power plant and power distribution markets, mainly in Europe, Africa and Asia (more). 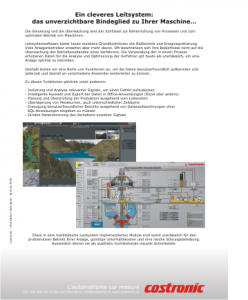 Costronic is the ideal partner for the migration of your Siemens SICAM 230 systems to Zenon Energy Edition. Costronic SA is currently installing the 125kV control and protection system for the new Romanel substation belonging to the SIL. Spread over eight months, this delicate project must be mastered from start to finish while guaranteeing security of supply. 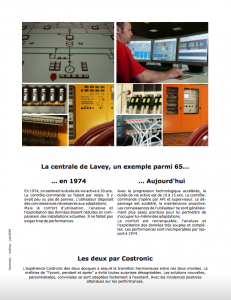 At the moment we are carrying out the complete control system of the new production group (16.8MVA) of the power station in Orsières (VS). The society Syngenta in Monthey, which manufactures herbicides, fungicides and insecticides to protect the world’s largest plantations, assigned the renovation of the ventilation of a strategic building on the site to Costronic. 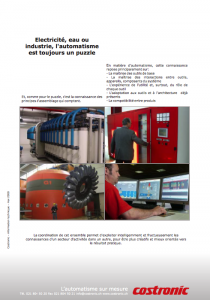 The water services of Lausanne city has charged Costronic SA to renew the control system of the ultrafiltration part with redundant system of the Lutry water treatment plant. 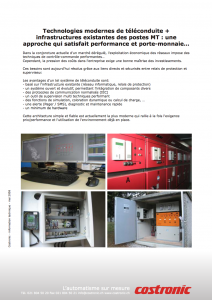 Romande Energie SA and Avançon Energie SA commissioned Costronic to study and fully set up the control-and energy distribution system for the Vionnaz power plan. We arrive at a final stage for the renovation of the automatisms (exept groups) of the Ripshausen power station as well as the setting up of a new SCADA (Gemeindewerke Erstfeld). 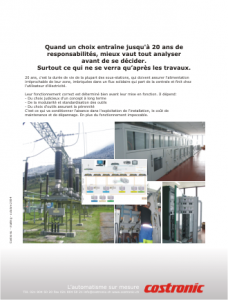 Costronic won a contract of several millions, dispatched over 4 years for the renovation of Verbois and Seujet control system (SIG). The complete renovation of the control system (General, managing, dam, groups and substations) of the Verbois power plant has now been completed and is in the hands of the operators. Costronic SA takes care of the maintenance of the new dispatching system in Giubiasco recently delivered to the municipal services of Bellinzona.